July 7 - Houston, July 27 - Valley Forge, Aug 4 - Nashville, Aug 18 - Tulsa, Aug 25 - Charlotte, Sept 8 - Jacksonville, Sept 15 - San Marcos. We started the latest run of CK conventions in Texas and we ended in Texas. It was a lot of fun, but, I have to say the last couple of months surpassed my normal "whirlwind" lifestyle and launched into a full blown Texas Twister! Seven conventions packed into a little more than 2 months... The craziness may have been enhanced by the excitement of the earthquake and the hurricane; but, seriously WHAT WAS I THINKING? I have a three week travel break to sort of catch my breath, get caught up on some things, and ponder my schedule for 2012 before the contracts are due. It is going to be a tough decision (which conventions to go to and which to eliminate from my schedule in 2012); however, as much as I love visiting new places and teaching at conventions... the last couple of months have really been "insane!" By the end of this recent "tour" I was more than just a little home sick. Lesson learned, I am making it a goal - NOT to be away from home (and my studio) so long next year. I have always loved the musical "Oklahoma" and even though I didn't see a lot of haystacks or surreys with fringe, I really enjoyed my first visit to Tulsa, OK. 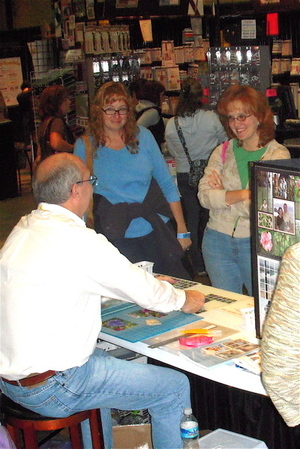 The CKC Tulsa scrapbook convention was held at the Renaissance Tulsa hotel and convention center. When we arrived we were greeted by a very nice cowboy who asked us if we needed help with our luggage. Inside the lobby there is a very nice citrus infused "watering hole" - a very kind way to welcome guests who are coming in out of the very HOT weather! In the guest rooms, the beds are comfy and the pillows are plentiful. And where else can you rest your weary legs while sitting on a "raw hide" covered couch? At the end of the day when you find yourself famished, the hotel has a nice restaurant that serves some great Mediterranean style dishes. Kevin and I enjoyed spending last weekend at a CK Convention that is held in the gorgeous Gaylord Opryland Hotel in Nashville, TN. It was my first time at the Gaylord Opryland. (I attended previous conventions in downtown Nashville.) I can see why CK chose to move to this location. What an inspiring atmosphere! Before and after classes I wandered through the hotels atrium. 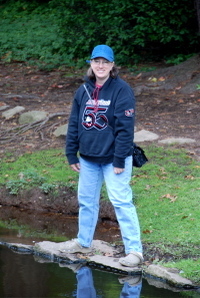 There were plenty of waterfalls, water features, flowers and foliage to keep my camera busy. The hotel is not an inexpensive one - for sure. The CK rate was $139 per night. That didn't sound too bad; however, when you make your reservation, the hotel will let you know there is a mandatory resort fee ($15+) and parking ($18) on top of the additional government taxes and fees. All added, I think the rooms come up to around $200 per night. If you are feeling like splurging - it is a very nice place to stay. And if you are looking for a relaxing way to tour - there is a boat ride through the atrium too! I am home for a couple of days before Kevin and I head west for the CKC in Nashville. We have a long list of tasks to cram into these two days! I got up at 4:30 AM this morning because I needed to chat with our Journella programmer. We have some exciting things in the works and I hope to unveil VERY soon! I met with the programmer (via skype), did a little testing, added some posts, checked my e-mail, checked the new forum (THANK YOU to those who are posting!) and then decided it was time for breakfast. We might just have found it! 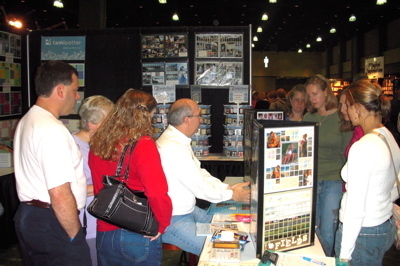 Last week Kevin and I traveled to Houston, TX for the CK Houston scrapbook convention. We think we may have found our all time favorite (so far) convention venue in the Woodlands, TX. I don't think there was anything missing. We loved the Marriott hotel's comfy beds with plenty of pillows. There was a lovely view from our room - a waterway and park area. (You can see the water taxi in the photo below). We decided we really had to explore the area which was right outside the hotel's back door in the lobby area. The hotel has a nice outdoor seating area, with water features, that overlooks the waterway. and in the tunnels under the bridge there is Mosaic Art. Could we ask for better inspiration? We are looking forward to returning to Houston's Woodlands in 2012. We hope if you didn't have the opportunity to join us this year you will put it on your schedule for next year. In addition to the wonderful surroundings at the hotel there was lots of shopping, classes, and plenty of time to crop. It is time to get serious and make some big decisions. The 2011 convention schedule is out and the deadline for classes is quickly approaching! I have many fun ideas running through my head; but not all of them will survive the cut. Which classes will we move forward with and which will go on the back burner? One class that is always on the top of the list: our Mosaic Moments "beginner" class. We always want to be sure we offer the opportunity for a hands-on approach to Mosaic Moments basics. For those of you who have been waiting to join us in 2011 - lets just say this class is going to be SWEET! 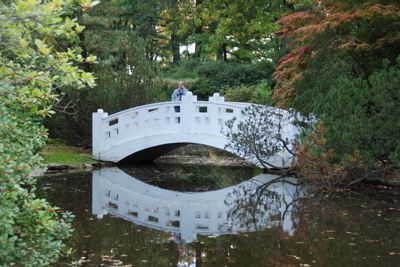 One of our most popular classes in 2010 was our panoramic technique class. For those who missed it - don't fret! We will be offering an all new Panoramic technique class in 2011! Does our list include the techniques you want to learn? I almost always bring my camera to class - I almost always forget to get it out and take pictures; but, not this time! Kevin was my helper in the evening class. Thank you ladies - I had a fabulous time! Are you familiar with this painting? Georges-Pierre Seurat spent two years painting A Sunday Afternoon on the Island of La Grande Jatte. If you live in Columbus or are planning to visit Columbus you don't want to miss The Topiary Park, inspired by Seurat's painting. The Topiary Park was a delightful way to spend a little quiet time together on a Saturday morning. Bev Howard, from Awesome Albums, recommended a funky little restaurant called Lynn's Paradise Cafe. My photos don't do any justice to the fun atmosphere - inside or out; but, may be you'll get a little idea. the walls were decorated with a variety of interesting things. they had all kind of different lights - like these cheerful bulbs. I don't know if you can see them well - but there is a row of "legs" mounted above the windows on the left. The bright "globes" to the right are paper lanterns. Of course the most important part of any restaurant is the food. Photo above: Pecan Crusted Chicken, Baked Mac and Cheese, and Sweet Potato Fries. Lynn's Paradise Cafe got a thumbs up from us. Our meals were delicious! Traveling around the country to Scrapbook Conventions means we have a lot of "departure days." Those are always the craziest days of the week. It seems I am always scrambling around at the last minute trying to find something or clean something. Packing all the stuff that I didn't just leave in the suitcase from the last trip. Getting the kids settled or their stuff packed up - which ever applies. Charging the iPod, cell phones, and camera batteries. and getting Cole chicken soup & hot chocolate, before I run Alexis to her Wednesday dance class after packing everything in the car. And then I realize, everything is replaceable - except the stuff I need for classes, so as long as I have that I am okay! Who was it that said, "the journey was part of the gift?" When I decided to do a quick paced class and call it "8 page Round Up," Kevin said, "You need a hat and pair of boots." I thought new boots sounded like a fun way to "get into" the mood. A few weeks later, I saw some adorable "cowgirl style" boots while visiting my SIL in Washington. The store at the mall had them in two colors, brown and red. Both were cute, but the red ones spoke to me. Unfortunately, it seems they were saying "sorry no size 6." No big deal. I'd find a great pair of boots somewhere. Only one little problem - I don't really shop. I used to shop - almost every day. My friend Jaime and I were shopping pros (well she was the pro and I was the beneficiary of her skills.) Now that we live thousands of miles apart - she is still the skilled mall shopper - I am more of a skilled Internet surfer. I thought I was doomed. Here I am just a week away from my first class, I still don't have boots! Okay, so they aren't exactly a classroom necessity but... do I really need to explain the desire for a pair of red boots? ...and I am way too busy to go on a store to store search. Of course, I am a skilled Internet surfer. There are hundreds of boots for sale on the Internet. Today I discovered Zappos.com. They are fabulous - So many shoes - and boots and they ship them really fast! ... and best of all, they had the same red boots I saw months ago - AND in size 6! Our weekends generally begin on Thursday. This week, we left our house between 4:30 - 5 AM EST to get to the airport. On this trip we had a short layover in Nashville, arriving in LAX at 11:25 AM PST. From the airport we caught a shuttle that took us to the rental car location. We reserved a mini-van - big enough to hold all our luggage, and from there we drove straight to the convention center in Pasadena. When we got to the convention center, our booth wasn't quite ready for set up. We took a short break to grab some lunch? dinner? (my stomach wasn't quite sure which.) When we returned to the booth we were able to finish all the "big set up tasks" before calling it a night. Because we are away from home, and often in unfamiliar places, I generally make reservations with a hotel chain I am familiar with. I appreciate a nice place to "land" after a long day of travel and work. Some hotels are more welcoming than others. Can you believe they hung a mosaic style print in our room? That made us feel really special (wink). We had a very comfortable place to stay, so thank you Pasadena Courtyard! The scenery inside convention centers is pretty much the same from one location to the next. Sometimes I find myself asking, "Where are we?" or "Which state are we in?" I suppose it could all become pretty hum drum; but, even though we get tired from long days, I think it is important to find and participate in something fun at each location. On quick trips, like this one, finding time for fun can be more of a challenge. After we work 8:00 AM - 6:00 PM, teach class from 6:30 - 8:00 PM, and clean up until about 9 PM, (it is now midnight in our home time zone) and it is time to get some dinner. Kevin mentioned In-N-Out Burger, a favorite "out west" treat for us, but, we didn't realize what a treat we were actually going to find. When we arrived at the location (directed by our GPS) there was a huge line of cars backed into the street. The signs reading "please do not block our neighbors driveways" was a pretty big hint - long lines are not unusual. It was great. A bit of "burger history fun" at the end of a long day! After the convention ended on Saturday, we tore down the booth and set out for another dinner adventure. Kevin has a fascination with stadiums; so, before dinner he insisted on driving past the Rose Bowl. PF Changs has a great menu. I am a big fan of the dumplings. We ordered Mongolian Beef and Honey Chicken dishes. Can you guess which we liked the best? We had a late flight the next day so we actually got to sleep in! The downside to sleeping in - breakfast can be a little harder to find late in the morning. We decided to grab something on the way to the airport; however, for some reason, our route didn't seem to be taking us past anything "good." Donuts do not fall into my usual "breakfast food" category; but really, how do you drive away from such a fun place? We ordered 4 donuts: 2 maple bars, a long john (chocolate covered, cream filled), and a coconut covered. They were all fresh and delicious! The flight home was pretty uneventful - the best kind. We stopped in Las Vegas and arrived in Virginia just before midnight EST. 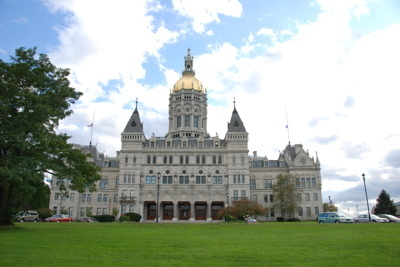 Kevin and I had a splendid time in Hartford. We had time to go to Wickham Park, after setting up our booth on Thursday. After an hour or two at the Park, we return to our hotel and walked around downtown. We even gave ourselves a self-guided tour of the capitol building. I spotted this row of portrait clad boxes in an upstairs hall. Do these boxes say election year? If you were at the Hartford CKC you may have met Kevin - my husband and designated Mosaic Moments "convention demonstrator." While he was demonstrating I was helping at the register. This "role change" is nice for us both - as I am usually the "creative" expert and he is generally the one who "handles the money." We enjoyed meeting all of you who who were in class and who came by the booth. It is truly a thrill for us to chat with fellow photo enthusiasts and we are grateful for your support. Kevin and Paije are enjoying this "last show of the summer." I say the "last" because after St. Charles, Paije will be heading off for her first year of college. Very exciting for her - a little emotional for mom and dad.